Notes: This movie concludes the Neon Genesis Evangelion series. The end of the Neon Genesis Evangelion left many questions as to the fate of NERV, the Children, the Angels, and many other plot factors unanswered, unexplained, or otherwise hanging. To answer a legion of now befuddled Evangelion fans, Gainax remade the ending into a two-part movie known as Death and Rebirth which was to supersede episodes 25 and 26 of the television series, which then led to this movie, Death and Rebirth itself being recreated into part one of The End of Evangelion. It begins much in the same fashion, with the final Angel already having been defeated, and the current enemy switching to humanity itself as SEELE unleashes its own plan for the Evas and NERV...and indeed for the entire human race. What role will Shinji play in this ever-tense situation, as NERV gets chewed to pieces by SEELE's crack commandoes? Will Gendo's plan swallow up all of humanity? Will Hideaki Anno ever figure out how to end an anime? These questions and more will be answered in what looks to be the final installment of Evangelion. But at what price? Oh boy. It took almost a month to figure out the thoughts in my head surrounding this. As a once sworn Evangelion fan who, admittedly, could not afford to finish the series on his own, I'd been spoiled on the end for a long time, but had managed to hold off on the movies until I thought I was ready. But even the most ardent Eva-head couldn't be prepared for this. I don't know whether to call this Anno's masterwork...or his downfall. Indeed the first half of the anime (once you get past a VERY disturbing scene with Shinji which we refuse to get into detail about) becomes what everyone seems to love about Evangelion, with suspenseful, well-directed drama scenes interspersed with enthralling, violent, edge-of-the-seat Eva action, with enough pseudo-Christian imagery to make a high school English teacher salivate. That NERV would so quickly fall to SEELE's commandoes does seem a BIT on the sloppy side, but then, that's forgivable (I guess) seeing as NERV has concentrated on fighting Angels rather than an internal conflict against fellow humans. As Shinji, in the final form of EVA-01 rises above the ruins of NERV and into the screen like a demon rising out of the bowels of Hell itself, one wonders if Gainax- no, Hideaki Anno had redeemed himself in the audience's eyes for the end of the TV series. End it there, and you have the makings of a classic. But Anno made a crucial error. The second half of the movie ... is so incoherent and obtuse that it completely loses the mainstream audience (and in fact, virtually any audience) this series has attracted before. It goes beyond art film...and beyond anime. And in doing so, it goes beyond the audience's capability to understand and be entertained, which defeats the purpose of something labeled as entertainment. With a melange of still images that put MTV commercials to shame and pans of movie theaters (I guess this was the audience participation moment of Eva?) and street-scenes ... (live-action, mind you!) Anno's directing went from masterful action and suspense, to long moments of budget-less, animation-less anime. What is anime without animation? And then, the bizarre, anticlimactic ending, which was as utterly insane as the end of the television series, just left me with a bad feeling in my gut that required several episodes of Slayers TRY to exorcise. 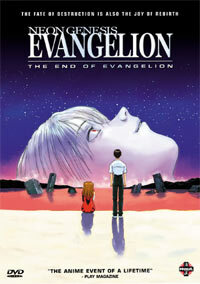 Part Two of The End of Evangelion was simply the longest half-hour I'd ever spent watching anime. Period. I figure that Anno was attempting to reach out to the audience with his philosophy through Rei, as she engulfed the Earth (something reminiscent of Akira but not exactly the same) and left Shinji to decide its fate. (And Shinji's decision ... well, what would happen if you gave the fate of the world to some withdrawn, spineless little twit that wants nothing to do with the rest of humankind? Gee, I wonder ...) It genuinely hurt to watch. But then, so has this entire series. It did, in a sense, make me think about life in general ... somehow. But in the end, The End of Evangelion was an oddly fitting capper to an absorbing, startling, and very unconventional television series. Some say you either love Eva or you hate it. I have to make the exception here ... since I feel both. I loved the first half, and HATED the ending! It's not a matter of this reviewer's failure to understand the ending to this movie. I understand this movie plenty. Rather, it's a matter of rejecting everything this movie (and this series) has been trying to indoctrinate into the viewer as hollow, soulless, hypocritical, and false, nothing more than the ravings of a mad, nihilistic creator, a middle finger at all the fans while cashing in on the success of the franchise. It's a marvelous bait-and-switch and a stunning success of marketing, but a terrible, terrible work of film that is only impressive if you consider stuff like Blair Witch Project to be serious cinema. I still recommend that any serious fan of Evangelion should watch this and decide for themselves. Personally? If I read another e-mail asking me to watch this movie over again, there's going to be some hurting going on, and it's not going to be *my* head. Recommended Audience: Shinji's, ahh, "scene" at the beginning of Part One, gruesome mecha violence, SEELE's ruthless commandoes summarily executing civilians, and sheer psychological trauma will bar all but older teens and adults from watching this one.